Hi everyone, it’s Cindy from Little Miss Celebration and I’m very excited to be visiting with Jenny and all of you here at The NY Melrose Family. Let’s hope that the brutal winter weather is pretty much behind us so we can focus on spring and Easter! 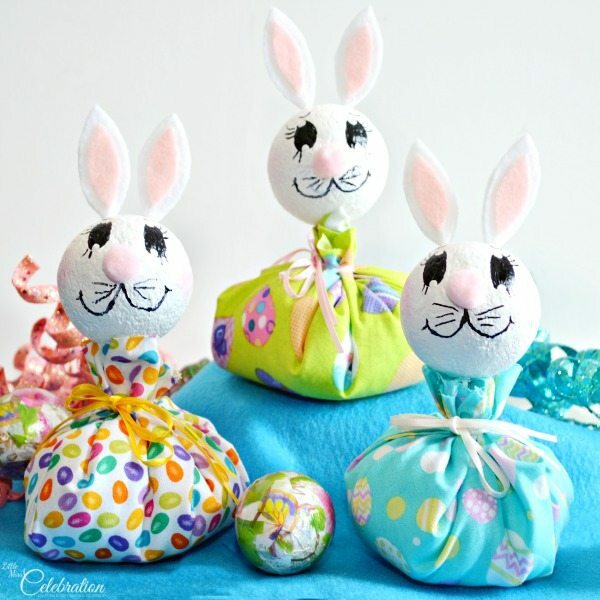 Today, with a little fabric, felt & Styrofoam, we’re making some cute, Roly Poly No-Sew Bunnies, adorable for decoration, to pop in a basket or great favors for Easter dinner guests. 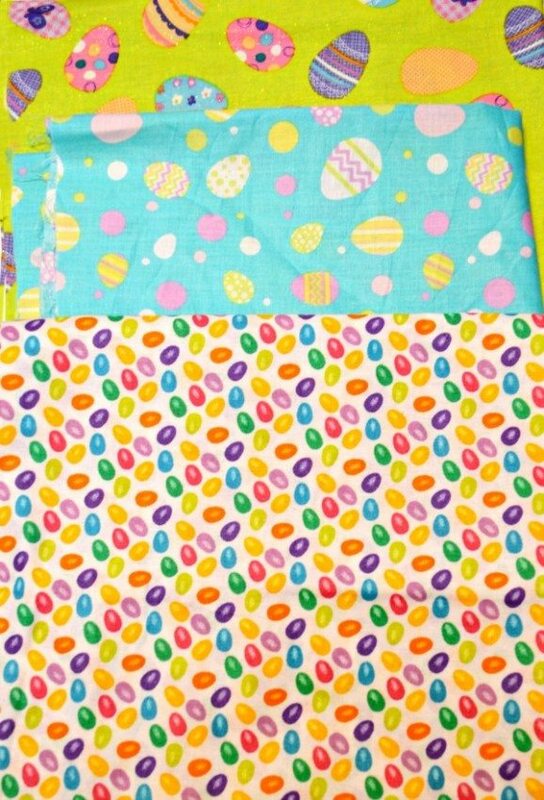 The sweet Easter patterned-fabric came from JoAnn. I love fabric! I grew up with two grandparents who were both in fashion and there was always fabric everywhere. Between the two of them, they could literally make anything. You know how they say genes sometimes skip a generation? To date, the sewing gene seems to have skipped three generations in my family. It’s true – my mother, me, my daughter, none of us sew. That’s why I love a no-sew project. Makes me feel like I’m carrying on a tiny thread of the family tradition, at least a little bit. Well, I DID get the crafting gene from my grandparents, so all hope is not lost! The bunny bodies are simple to make! Cut a 12” circle of fabric. I actually used a 12” round serving platter as my cutting template. Unconventional, I’m sure, but it worked! Don’t even worry if your cutting lines are a bit zigzag, because those edges are making the bunny “neck” and a little zigzag adds character! Take a pile of fiberfill and place it in the center of the fabric. 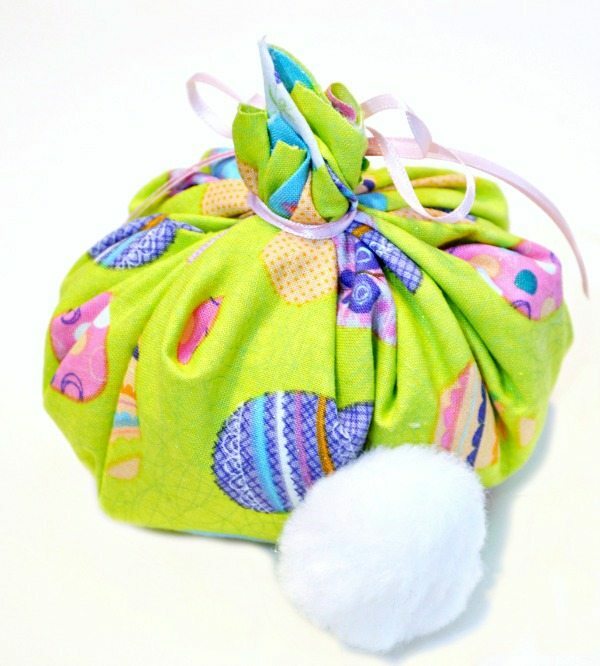 Use a lot for a really puffy bunny or less for a svelte bunny. If you don’t have fiberfill, use cotton balls or I’ve even dug into my Christmas supplies and grabbed a handful of Buffalo Snow. It works great! Cut a long length of ¼” satin ribbon in a color to compliment your fabric. Gather the fabric up to the center and tie tightly with the ribbon, leaving about 1” of fabric above the ribbon. Tie the ribbon into a single or double loop bow. All bunnies need a fluffy tail! 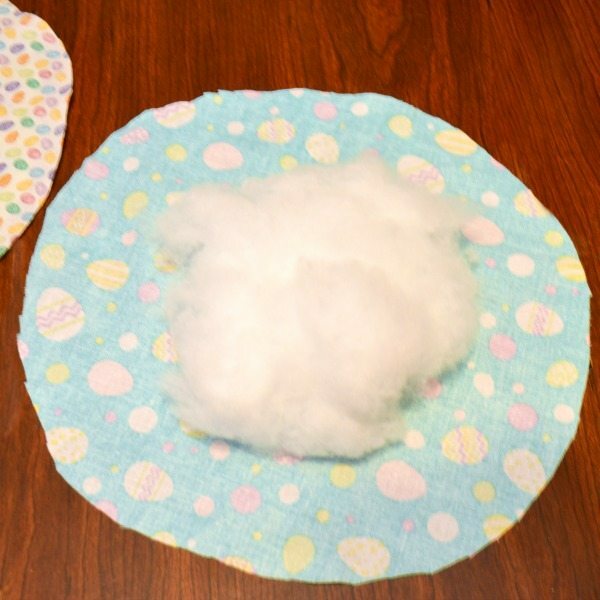 Using low-temp hot glue, attach a large, white fluffy pompom to the back of the bunny. The roly-poly body is done! Now, we give our bunnies some personality! 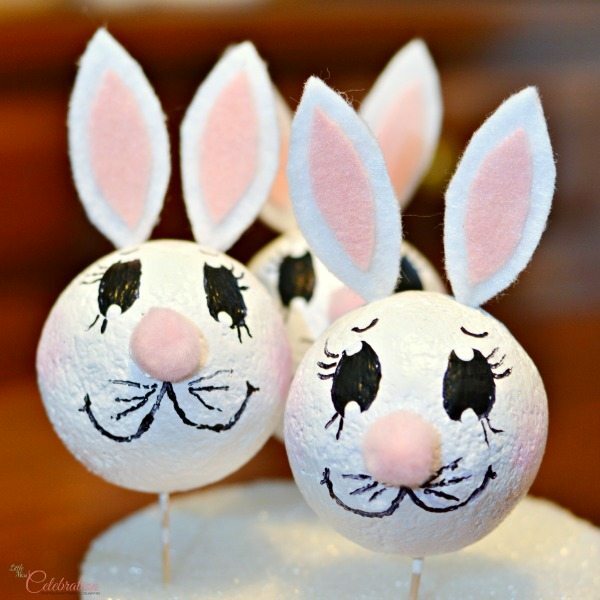 We’re using 2 ½” Styrofoam balls on toothpicks for the bunny head, but first they need some ears, right? 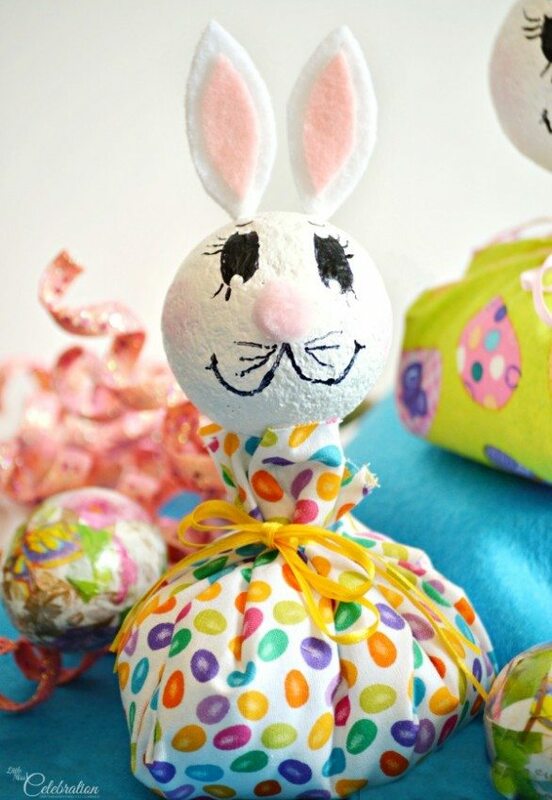 This is the same process I used last year for some Funny Bunny Jelly Bean Jars if you really want a bunnypalooza for Easter! For each ear, cut a two piece of white craft felt into an ear shape about 2” long, with points at the top and the bottom. If you want to give the ears a little extra pizazz, cut a smaller ear shape in pale pink felt. 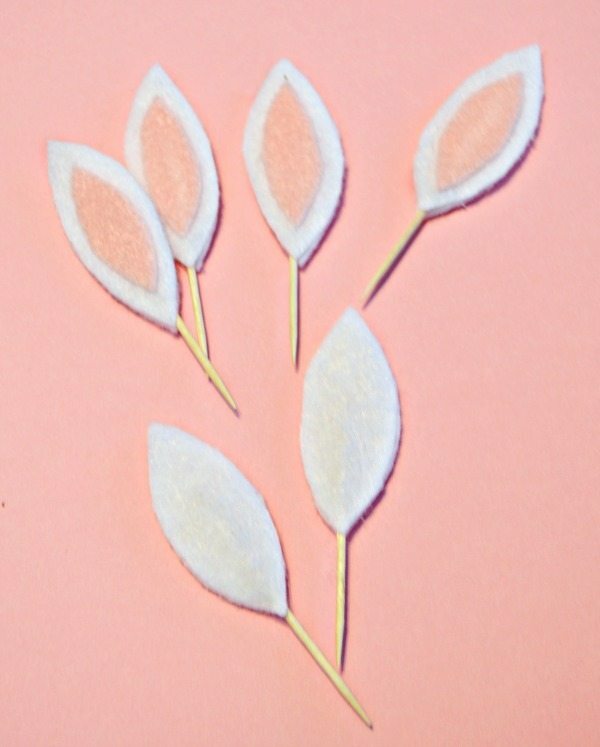 Attach the pink felt to the white felt ear with Fabric Mod Podge or fabric glue. Place a toothpick between the two white felt ear pieces, leaving about 1” of toothpick showing at the bottom of each ear. When it’s time to add the ears, we simply insert the toothpick into the Styrofoam head. Have you ever used MagiKote? It’s a magical product easily coats Styrofoam so it can be sanded and painted with acrylic paints. It simply brushes on and works on smooth and regular Styrofoam, which I used. After a few coats of MagiKote, I gave each bunny head two coats of white acrylic paint. I added eyes, mouth and whiskers with a black Sharpie, filling in the circle eyes with black paint and dot of white for highlights. Add a little pink pompom nose, some pink chalk for rosy bunny cheeks and place a toothpick in the bottom of the bunny head. Insert the ears and the bunny heads are ready! Add a little craft glue the toothpick in the bunny head and carefully insert the head down into the center of the gathered fabric neck. 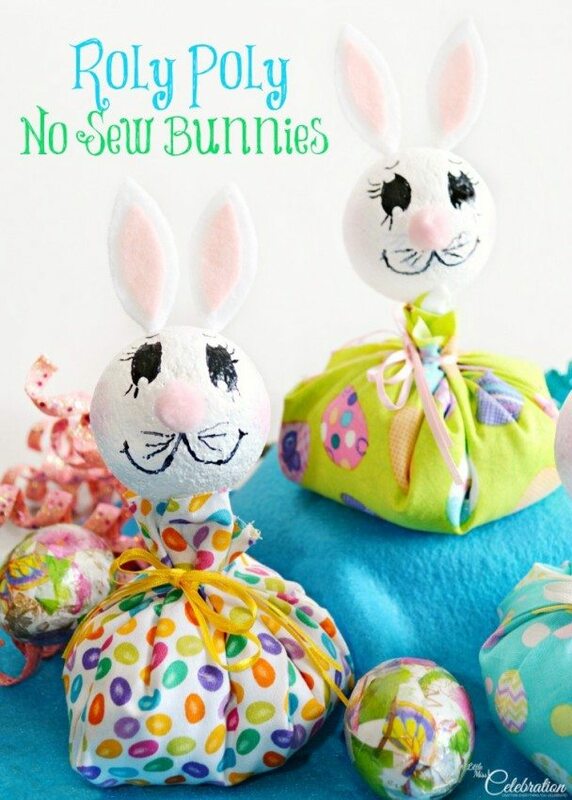 Our roly-poly no-sew bunnies are totally ready to help us celebrate Easter and spring! My hubby, aka Mr. Smarty Pants, is shaking his head over the whole no-sew thing. You see, I begged for a sewing machine TWO years ago for my birthday, vowing to learn to sew for the blog. I’m so ashamed to admit I haven’t even taken that shiny new machine out of the box yet. I think, maybe, 2015 is going to be the year, though. The sewing gene might not be completely doomed yet! Want some pretty eggs to go with your bunnies? Remember sugar eggs? You can make a Foam “Sugar” Egg! 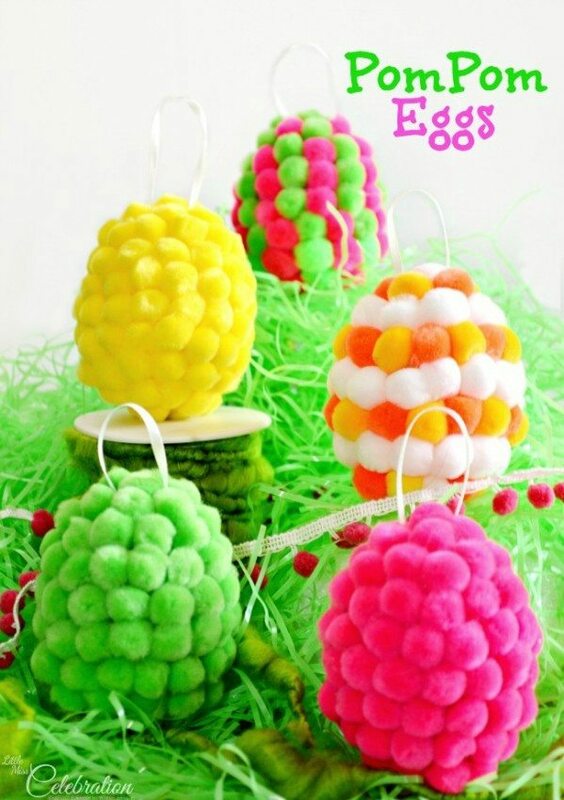 PomPom Eggs are inexpensive, whimsical and talk about easy! I’ve loved being here today and a big hug of thanks to Jenny! 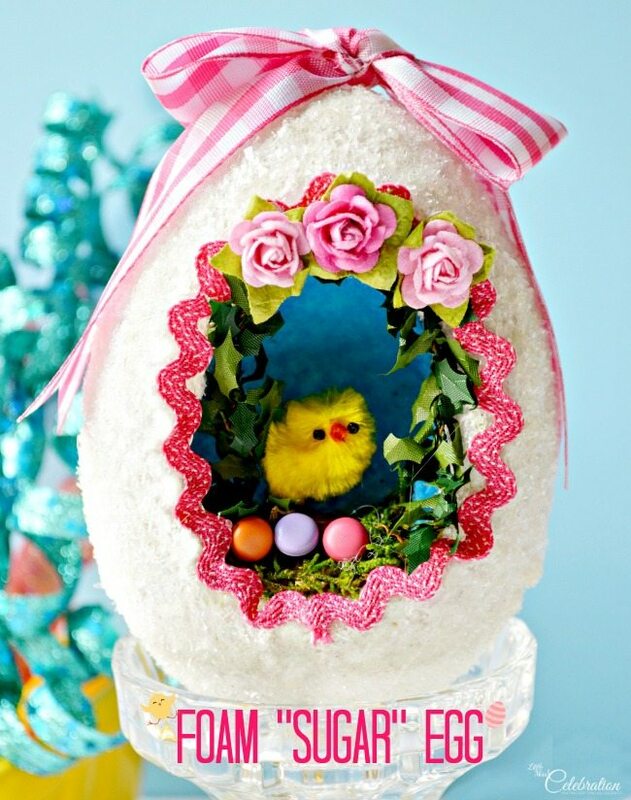 You are warmly welcomed to visit me anytime over at Little Miss Celebration, where we’ll be crafting and cooking up lots of sweet things all month for Easter and spring. Happy wishes for a wonderful Easter and start of a beautiful spring season! I don’t know how I missed these – too cute!